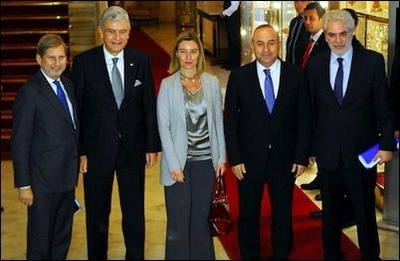 Posing in this December 8 photo are, from left to right: Johannes Hahn, EU Commissioner for European Neighbourhood Policy and Enlargement Negotiations; Volkan Bozkır, Turkey's Minister for EU Affairs; Federica Mogherini, EU High Representative for Foreign Affairs and Security Policy; Mevlüt Çavuşoğlu, Turkey's Minister of Foreign Affairs; and Christos Stylianides, EU Commissioner for Humanitarian Aid and Crisis Management. Judging from fancy, Kodak-moment photos that appeared in the press over the past week as well as related statements from European Union [EU] and Turkish bigwigs, one could be tempted to think that things are coming up roses between Ankara and Brussels. Facts, as often, are quite different from what smiling faces and repeated optimism reveal. On Dec. 6, Turkish Prime Minister Ahmet Davutoglu, accompanied by nine Turkish cabinet members, visited his Greek counterpart, Antonis Samaras, in Athens, where the leaders of these traditional Aegean rivals happily glossed over major differences and expressed support for closer relations. Davutoglu said that Turkey supports the return of the Parthenon marbles to Greece. That was sweet. But no one cares about whether Turkey does or does not support the return of the ancient marbles. And Samaras said he supported Turkey's quest for EU membership, provided it fulfilled the entry requirements. That was sweet, too, except that Greece has been repeating the same wording and Turkey has been fulfilling the entry requirements since 1987. Both leaders expressed hope that talks for reunification of the divided island of Cyprus would resume soon, probably knowing privately that even if talks resumed they would break down soon after. This author seriously doubts if either leader could recall how many rounds of talks have been held since Turkey invaded the northern third of the island in 1974 in response to a Greek Cypriot coup aimed at annexing Cyprus to Greece. For his part, Davutoglu said that "it is very important that hearts and minds are meeting." But outside the spiritual sphere of hearts and minds that meet, there is reality. Turkey has threatened to send its navy to the eastern Mediterranean if Cyprus goes ahead with its joint hydrocarbon exploration plans with Israel and Egypt. The three Mediterranean neighbors have ignored the threat and are proceeding with the exploration plan. Pleased with a new -- but apparently fake -- détente with Greece, Davutoglu rushed back to Ankara to host a high-profile EU delegation for a further exchange of pleasantries: Federica Mogherini, EU High Representative for Foreign Affairs and Security Policy; Johannes Hahn, European Commissioner for European Neighbourhood Policy and Enlargement Negotiations; and Christos Stylianides, the EU Commissioner Responsible for Humanitarian Aid and Crisis Management. Another Kodak-moment with smiles, and literally some futile talk about photography. Turkey under Islamist rule has keenly pretended that it wants EU membership, while in reality deeply disliking its "Christian" culture. After their talks, the Turkish team called on the EU to "make visible" the dialogue between Ankara and Brussels by "inviting Turkish leaders, to EU meetings and taking them into EU family photographs." The Union should "find practical formulas to invite Turkish leaders to EU meetings to take part in family photos of the union in a way visible to the public," Turkish EU Minister Volkan Bozkır said on Dec. 8. The truth is, Turkey's longer-than-half-a-century journey to full EU membership offers volumes of thick picture books full of similar smiling faces, most of them no longer alive. But both the club and the applicant know that Turkey has been dragged planets away from the EU in terms of culture and socio-politics. Turkey is too un-European in political culture; sometimes even hostile to Europe. EU leaders have pretended that Turkey would one day join the club, while knowing that it would not. Only a week before the EU bigwigs arrived in Ankara, Turkish President Recep Tayyip Erdogan accused western [Christian] states of "not liking us [Muslims]," for "loving oil, gold, diamonds, and the cheap labor force of the Islamic world," and for "wanting us [Muslims] dead and liking seeing our children die." All the same, the EU keeps on playing its part. "We decided to visit so early in our mandate in order to meet the good steps the new Turkish government decided to make in the EU accession process," was Mogherini's partly understandable euphemism. The EU cannot slam the door in Turkey's face for many geopolitical reasons. But it should realize that it lost almost all of its leverage on steering Turkey toward pro-EU reforms in the last decade or so. While the Europeans wasted their time in self-deception -- that Turkey's Islamists were in fact pro-EU, post-Islamist reformers -- Turkey was implementing a plan to turn into, not a member of, but a Muslim challenge to, what its leaders privately view as a hostile "Christendom." Today, only a third of Turks say they share the same values "with Christian Europe." Nearly 80% of them say they would not wish to have a Christian as a neighbor. Turkey ranks 154th on the World Press Freedom Index, according to Reporters Without Borders. Earlier this year, Freedom House, a prestigious pro-freedom institute, put Turkey into the category of countries it labels as "not free." Turkey, after Russia, ranks second in violations of civil liberties, according to the European Court of Human Rights. Similarly, after Russia, Turkey boasts the world's second biggest police force, at 475 police officers per 100,000 residents. Turkey under Islamist rule has keenly pretended that it wants EU membership, while in reality deeply disliking its "Christian" culture; and the EU leaders have pretended that Turkey would one day join the club, while knowing that it would not. Ironically, just a day before the EU delegation arrived in Ankara, Turkish writer Orhan Pamuk, who won the Nobel Prize for literature in 2006, denounced what he called a climate of "fear" in his country. A few years earlier, he had claimed that the "post-Islamists" would take Turkey into the EU.